This is yet another of my poems on developments in The Episcopal Church and Anglican Communion. The Rev. Canon Mary Douglas Glasspool and the Rev. Diane Jardine Bruce were each elected suffragan bishop in the Episcopal Diocese of Los Angeles. They were consecrated in a single ceremony on May 15, 2010. 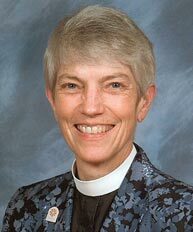 Although Glasspool and Bruce are the first women bishops in the Diocese of Los Angeles, that is not why their consecration has occasioned special interest. Glasspool is the first partnered lesbian to become an Anglican Communion bishop. As of May 15, Gene Robinson is no longer the sole active homosexual bishop in the House of Bishops of The Episcopal Church. Glasspool’s consecration, I think, is a clear indication that The Episcopal Church is not going to retreat from its move to a more inclusive church, despite what elements of the Anglican Communion may think about it. It is now time for Bishop Glasspool to show that she can be a good bishop, not simply a lesbian bishop. I have no doubt that she will do that. Once I began writing, I finished the poem quickly, in time to post it on my blog before the consecration began in Long Beach, California.